Verani Realty’s Somerville agents put on their walking shoes to bring awareness to the issue of affordable housing in the Boston area – and they brought a big check with them. After participating in the Somerville Community Corporation’s annual Save Our Homes Walk this June, they delivered a $1,500 donation to the organization on the steps of Somerville City Hall. The funds were donated through Verani Realty’s philanthropic and social development initiative, VeraniCARES. Verani Realty agents and staff have the option of donating to the fund by either payroll deduction or from sales commissions, and Verani Realty will match up to $10 per donation. 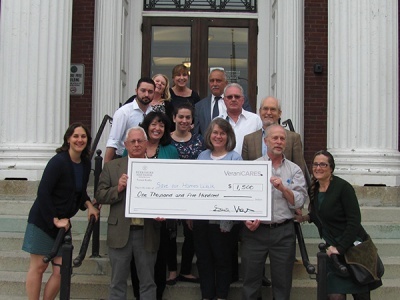 VeraniCARES is supporting many community and charitable initiatives across New Hampshire and Massachusetts this spring as part of its May Day campaign, which has dispersed $55,000 worth of donations, supplies, and volunteer work to those in need through nonprofits. The Somerville Community Corporation is based in grassroots community organizing and is dedicated to creating a Somerville where families and individuals from various backgrounds have equitable access to housing, economic stability, and opportunities for leadership. Their services financial education, real estate development, mediation, and programs for job-seekers and first-time homebuyers. Their annual Save Our Homes Walk is dedicated to preventing homelessness in Somerville.